So today, on this third day of the 2014 World Cup, I went to a typical American suburban mall to see what kind of Cup gear stores like Modell’s, Lids, Footlocker, and Champs Sports might be selling. The only surprise I encountered in my lazy window-shopping afternoon was how expensive the scarce World Cup clothing items were. I guess that’s supply and demand for you, but I happen to agree with Macklemore that $50 for a t-shirt—or even $30—is just some…well, BS, even if the shirt evokes Clint Dempsey or Neymar. I sadly had to turn down an opportunity to buy a t-shirt graced with my favorite player’s name on the back, but I now have more to spend at a bar in the city for USA’s first match on Monday. More on that in future posts. 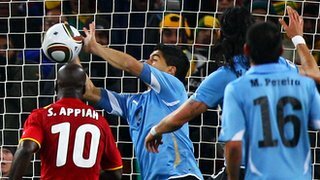 Luis Suarez 2010: Vile Felon or Resourceful Hero? Anyways, the surprise I felt at the mall was nothing compared to the shock of returning home to find Costa Rica beating Uruguay in the second half of their opening match. Clearly, striker Luis Suarez’s absence affected the Uruguayans’ prowess. They had no one willing to block shots on goal with their hands, and Costa Rica put three straight past La Celeste after Edinson Cavani’s early PK. Uruguay’s nickname means “The Sky Blue One,” and the team sure was blue today. Just before the final whistle, Uruguayan defender Maximiliano Pereira earned himself a red card for a reckless kick before storming somberly into the locker room. Oscar Duarte’s 57th minute header put Los Ticos up 2-1. The angles of the Costa Rican goals were beautiful, first on a header by Oscar Duarte and then on Marco Ureña’s cheeky pass into the open left side of Uruguay’s net. 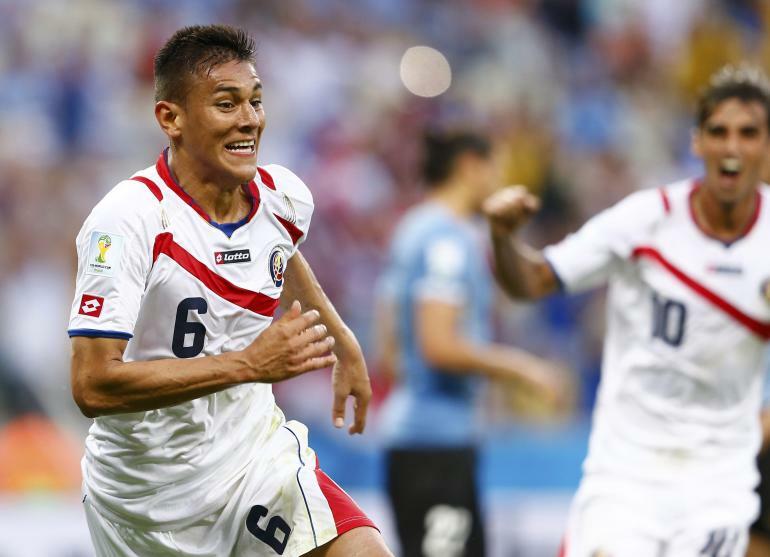 The Costa Ricans looked good rather than lucky, sending a message to the other two powerhouse teams of Group D who played later on in the jungle city of Manaus. This group is going to be a doozy, and no win will come easily. The second surprise of the day was that 2 of the most exciting players with the ball at their feet in the whole tournament play for sorry old England. Watching their match against Italy, I was shocked at how talented 19-year old Raheem Sterling and 24-year old Daniel Sturridge are, even on an international stage. Now I understand why Liverpool almost won the Premier League but didn’t. England almost beat Italy but didn’t, not because of Sterling or Sturridge exactly, but because the older players couldn’t deliver when it mattered. Daniel Sturridge scoring England’s one goal on a play that started with an exquisite pass from fellow Liverpudlian Sterling. Steven Gerard, Glen Johnson, and most importantly, Wayne Rooney needed to bring some kind of fire and competitive energy or just a goal to the second half, but they couldn’t muster it. Instead, many of us Americans thought that perhaps some of the players in the England squad are hoping to make it in the NFL as field goal kickers, what with all of the horrendously high, over-kicked “shots” in the second half. Hey, there’s no such thing as an over-kicked field goal. The higher and farther, the better. But the NFL draft is over so let’s get back to soccer why don’t we? 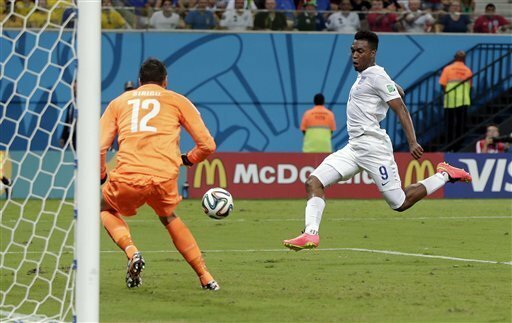 England was the more talented team today. They just didn’t know it. They didn’t have the confidence necessary to finish great passes and mesmerizing dribbling with goals. And therefore, despite the many chances they created to Italy’s few, they were not the better team, and they did not deserve to win. One of my favorite moments in the match was when Mario Balotelli—who had scored a goal early in the second half—was fouled by an English defender but grabbed the wrong knee as he rolled around in agony. As in the English defender had knocked Balotelli over so that he fell awkwardly on his right knee but once on the ground, because he was not hurt in the slightest, Baloteli forgot which knee was supposed to be hurt and chose the wrong one. Priceless. Besides playing with more confidence and prowess in front of net, this English side will have to apply more pressure on future opponents’ midfielders so that talented players like the dwarf warrior Gimli—otherwise known as Italian midfielder Andrea Pirlo (with his current beard)—don’t torch them. Again, there is no easy matchup in this group, except of course for the teams playing England when the Three Lions believe that NFL kicking scouts might be in attendence. Don’t count out Costa Rica—they’ve put themselves in a great position to advance, and they may just be the darling you don’t want to miss of this year’s tournament. Neymar posted this gem from practice on his Facebook page. Tika-Taka, Tika-Taka, Tika-Taka…. Van Persiee!!! !